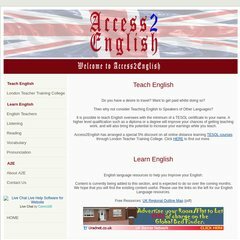 Topics: London Teacher Training College, English Teachers, Listening, Reading, and Vocabulary. It is hosted by 1 1 Internet Ag Baden-wurttemberg, using Apache web server. It has 2 DNS records, ns46.1and1.co.uk, and ns45.1and1.co.uk. The programming language environment is PHP/5.2.17. PING www. (82.165.118.29) 56(84) bytes of data.